We’ve been hearing for some time (starting with an ex-Youtube employee) that the number of video streams per day reported by Comscore, Nielsen and other metrics services way under-report on Youtube’s total video streams. It’s hard to compare apples to apples, though. Recent Comscore data says Google/YouTube streams just under 7 billion videos per month in the U.S., up from around 5 billion/month late last year. That’s about 225 million streams a day, which still puts them well above all the next major competitors (MySpace, Hulu, Yahoo, Viacom, Microsoft, etc.). 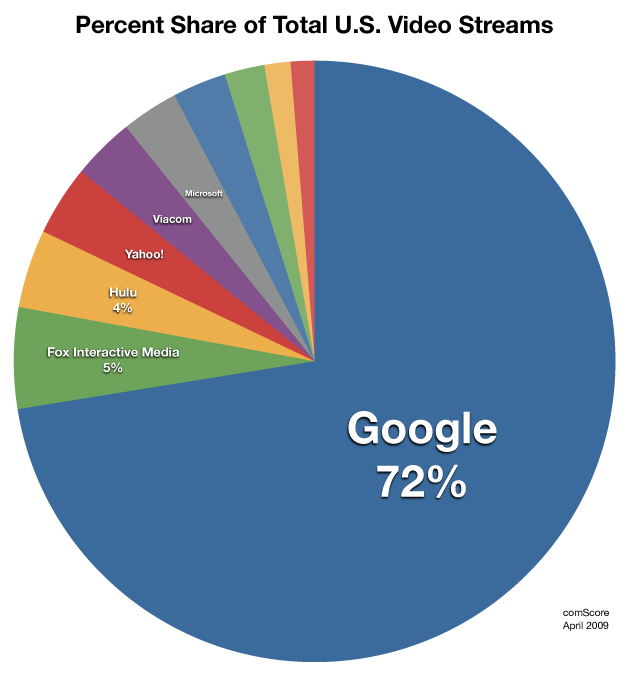 Nielsen says Google/YouTube streams 5.5 billion videos/month in the U.S. But the real number of streams/day, we’ve now confirmed with a source at Google, is above 1.2 billion/day worldwide. That matches what we’ve heard from other sources. That pretty much means everyone on the Internet, on average, is watching one YouTube video per day. Google hasn’t commented on this in the past, and we can’t figure out exactly why. It may have to do with ongoing litigation and the desire to keep exact numbers quiet. Or it may be that they don’t necessarily want analysts to have deep insight into YouTube’s true cost structure. We’ve spoken to Comscore about this casually in the past, and they’ve noted that their estimates are based on available data, and that data doesn’t involve direct access to YouTube servers. Some companies choose to give Comscore deep access, others don’t. The data quality suffers accordingly. But one thing is clear. Comscore thinks the total online video space is around 17 billion monthly streams in the U.S. We now know that YouTube alone serves that many video streams every fifteen days or so worldwide. Time to revise those numbers up – if YouTube has 40% of the online market share for video like Comscore says (it may actually be much higher market share, another reason Google may not want this data out there), that means the total number of video streams on the Internet is approaching 80 billion/month, a heady number. We’ve approached MySpace and Hulu, the no. 2 and no. 3 online video services, for their exact streaming numbers. So far, no response.